Summer mini-dirndl high-necked. Colour light blue beige. As light and airy as a bright summer's day, Marjo's new mini headdress will delight those who enjoy the joy of new styles and colours. The neckline picks up the new trend for a high-necked dirndl. 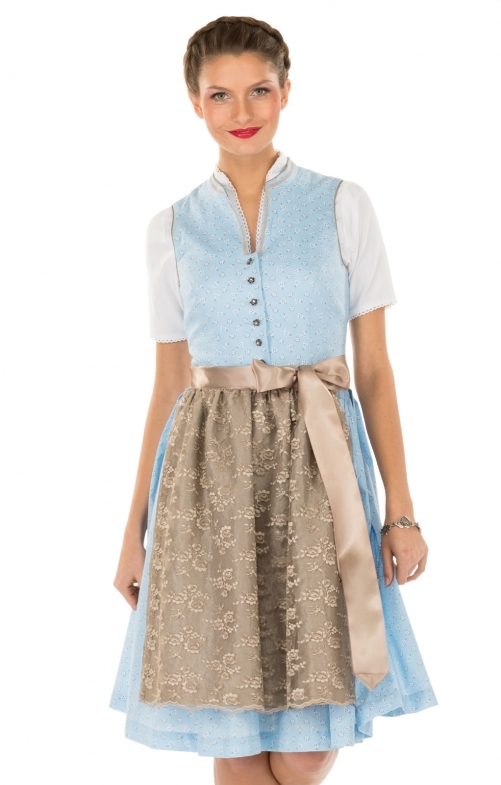 The front of the mini dirndl is buttoned with small rose buttons and the narrow neckline ends in a small raised collar bordered with a brown decorative border. The dirndl is made of 100% pure cotton, mercerised and not only looks light and elegant but also performs well in warm temperatures. The mini dirndl design is covered with small scattered flowers. The apron is doubled, so that the fine organza in beige comes to its best advantage. You will like this short Dirndl with 58cm skirt length.